Halloween is just around the corner! Nothing gets me more in the mood to celebrate the holiday, or just the fall season in general, than watching a themed movie or binge watching a spooky show. I've gathered up a few of my favorite ones in the graphic above with all the movies and then the three Halloween-ish shows at the end. They aren't in a particular order of importance except for Hocus Pocus, because that will always be my favorite! Some of these movies are still considered kid's movies, however I think you can enjoy them at any age! One of my favorites to watch for nostalgia is The Little Vampire. If you haven't watched it, it's essentially the story of a little boy that moves to Scotland where he befriends a young vampire and his family and tries to break a curse. It's such a cute movie! Another favorite of mine is the Halloweentown series, mostly the first two though. Definitely not the one where they change the main actress (aka Halloweentown High), avoid that one at all costs. Other nostalgic movies include Monsters Inc. , The Goonies, and Casper. I didn't include too many horror or actually scary movies/shows, because I know that isn't everybody's favorite genre. I did, however include the classic movie Scream on this list because if you are going to start watching horror films, this is a very easy one to start with. The story is entertaining and the movie itself isn't all that scary. It was actually terrifying the first time I watched it though do to a creepy coincidence. My roommate and I were watching it together and a doorbell rang in the movie right at a scary part, and then immediately after our doorbell rang and both of us screamed. It turned out to be someone delivering a package, but it was so scary at the time! The delivery guy got a good kick out of it though when we filled him in on what happened. I also decided to include three tv shows on this list just in case you want something that will last you a while! If you're looking for something a bit older with a lot of variety I recommend The Twilight Zone where every episode is a take on some kind of alternate universe. Super interesting and thought provoking while still being extremely entertaining! I also added American Horror Story to this list, and I think it might actually be the scariest thing on this list. I highly recommend seasons one and three, and yes, you can watch them out of order! Every season tells its own story, with some seasons being scarier than others. If you want the least scary, definitely go for season 3! Finally I also added Stranger Things, which I'm not exactly sure how to describe. It follows a lot of creepy and weird things happening in a small town and how individuals are disappearing, dying, or appearing in the town. It's a great show and the creators of it actually graduated from Chapman a few years ago! Plus the second season comes out on the 27th, so it's the perfect time to start binge watching! Have you watched any of these movies? What's your favorite thing to watch during the Halloween season? I'm sure these are great picks - I'm just not into horror/scary film genres! I get too freaked-out, lol! But i'd say anyone who's into Halloween/horror films might appreciate them. I love Halloween but not the spooky/scary stuff. We have been watching Transylvania 2 this past week with my 5 year old and her friends. We also like the new Vamparina on the Disney Channel. I'm going to have to checkout some of your suggestions soon. I love all these movies! Hocus Pocus has always been my favorite movie since I was little. I love halloween. This year we are going to watch Candyman and New Nightmare. I am into the more adult side of the halloween movies, but I did love Coraline. I love these movies especially Harry Potter, Casper and Hocus Pocus! I prefer horror/gore movies during October. I saw The Babadook yesterday and it was interesting. Fright Fest on AMC is always good. And Walking Dead comes on near or shortly after Halloween! I like the tamer movies and shows as well, especially things I can watch with my son. Some of my favorites are on here! I also love the Exorcist and Amytiville Horror, and the Omen! Love so many of these movies! But what I'm most excited for is Stranger Things season 2!!! SO SOON! Perfect list! I love Hocus Pocus! You have a great list. I love Harry Potter and I really want to start watching Stranger Things, I've heard the best reviews! I'm down for any excuse to watch Harry Potter! I'm not really into scary movies which makes Halloween a difficult movie watching month! I love so many of these. Pure traditions. I loved Casper, both the movie and the cartoon. The Adams Family were a staple in our home. I LOVED Wednesday! Totally need to check out these movies! I actually haven't watched any Halloween related movies this year. I need to get on it haha. So many great movies and shows on this list! I'm so excited for Stranger Things, especially since season 2 premieres right before Halloween! One more week! TOWER OF TERROR! This movie used to really scare me when I was younger but my sister and I want to watch it this year! What a goodie! I love ALL scary movies! Literally, the scarier the better! I can't wait to watch something on this list this weekend. Hoping I can find Halloween Town on TV somewhere. I'm not a lover of scary movies either. I watched one with my boyfriend one time and almost punched him in the face I got so scared. Whoops! Halloween town is one of my most favorite classic Halloween movies! Hocus Pocus is my all time favorite! I could watch it over and over again! I am soooo ready for Stranger Things to be released! Thinking about re-binging it this weekend so that I'm ready to go. Haha. This is such a great list! 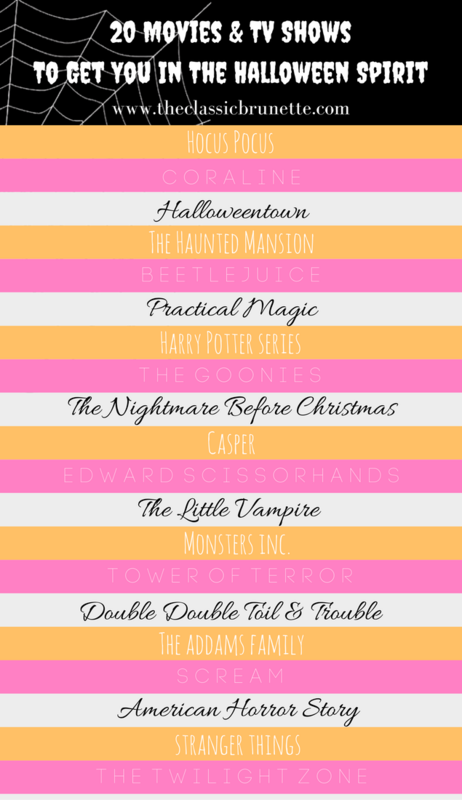 My favorites are definitely Halloweentown and Hocus Pocus. I'd also add "It's the Great Pumpkin Charlie Brown" to the list! So cute!! I love all of these. I can't wait to get into some spooky movies this week! I love ALL OF THESE. I'm watching Casper tonight!!!! I actually just watched The Haunted Mansion this afternoon! Such a fun Halloween movie!